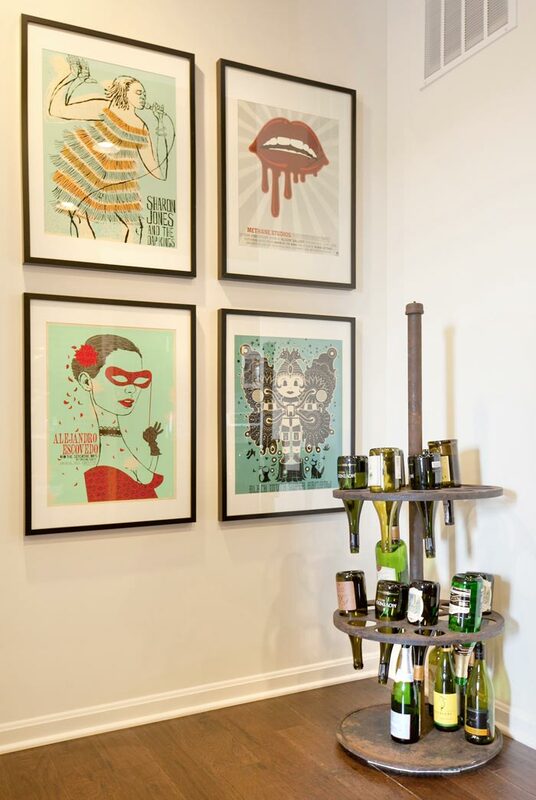 Wine rack with tour posters. 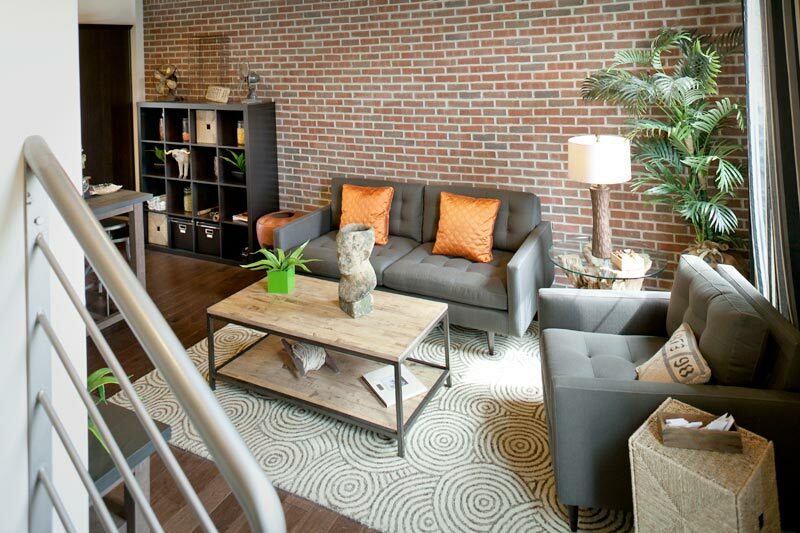 The main living area of the condo is located on the second floor. This image is of the wine rack located at the top of the landing. Nest Designs took an old industrial piece and converted it to a wine rack. Tour posters were framed and hung together to create a graphic statement on the back wall. Photo by Bealer Photographic Arts. The living level is part of an open floor plan that blends the living, eating and kitchen areas together. This image focuses on the living portion. Notice how the brick wall, the patterned area rug and the grey tones in the sofa and chair add color and texture to this space. Photo by Bealer Photographic Arts. The dining area seats four comfortably. 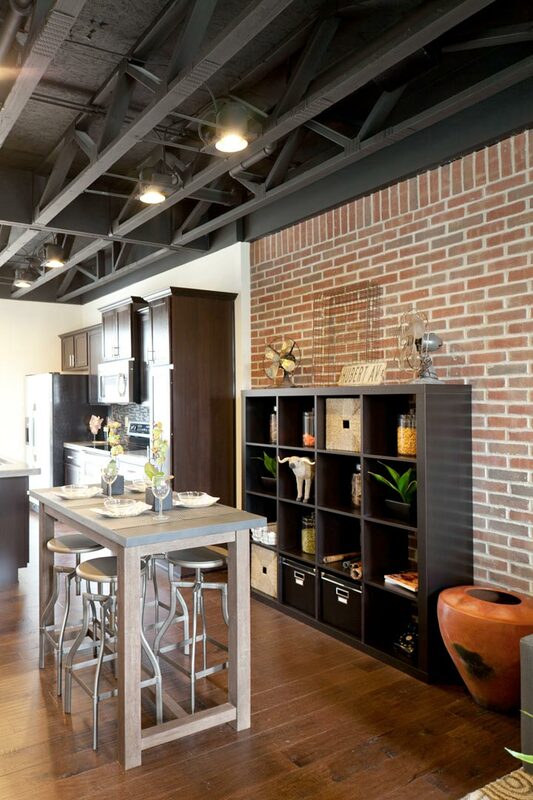 The brick wall in the background is the perfect compliment to the galvanized iron top on the kitchen table. The storage unit behind the table adds visual interest and storage at the same time. The metal stools spin to adjust the height. They are the perfect mixture of practical and functional seating with an urban feel. The kitchen area in the model already came with the gorgeous cabinetry. 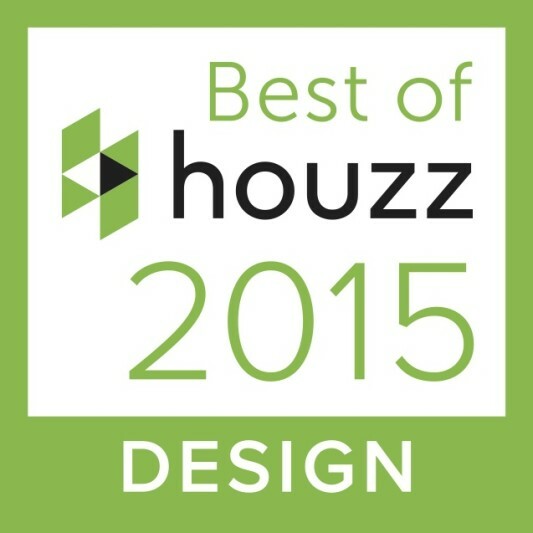 Nest Designs selected the finish color, the concrete counter-top, and the glass mosaic back-splash. Photo by Bealer Photographic Arts.